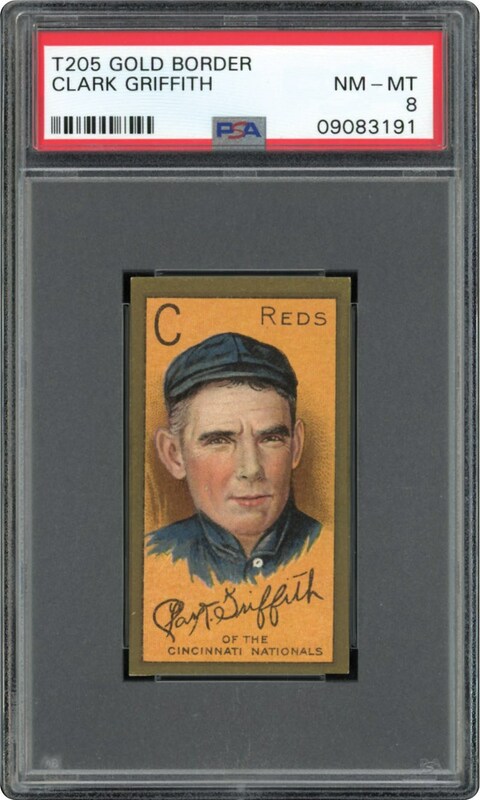 Lot # 16: 1911 T205 Clark Griffith (PSA NM/MT 8) - “1 of 4”; Highest Graded Copy! 1911 T205 Clark Griffith (PSA NM/MT 8) - "1 of 4"; Highest Graded Copy! You will engage in no arguments regarding the immense condition sensitivity of the 1911 T205 Gold Border tobacco cards due to the significant chipping associated with its fragile gold borders. Consider that the PSA "pop" chart lists nearly 37,000 encapsulated subjects, of which only 0.5% reside in "NM/MT-8" holders with a microscopic 0.02% graded higher. This justifies why elite enthusiasts engage themselves in a seemingly never-ending search to locate the Hall of Fame subjects fortunate enough to have survived almost a century of potential wear and reside in high grade holders. 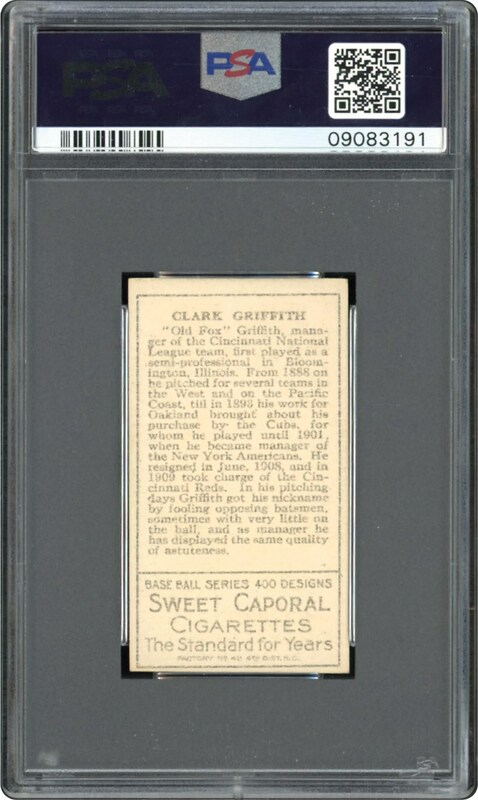 With that in mind, offered here is the iconic Hall of Fame player/owner Clark Griffith in a miraculous PSA 8 holder, one of only four at this hollowed tier and sharing the spotlight as the finest of its kind! Clark Griffith was nicknamed the "Old Fox", and while winning 240 games over a super major league career was more renowned for his 20-year managerial stint with four different ball clubs as well as becoming the major owner of the Washington Nationals. No doubt, Griffith's breathtaking representation on this offering places it as one of the finest of its kind, synonymous with his winning nature. Robust autumn orange and brown hues enclose a brilliant Griffith portrait image that is highlighted by pristine rosy cheeks. Uncharacteristically for any T205, only two microscopic-like specs of gold border surface wear can be seen; both of which reside at the utmost upper corner tips. Blistering sharp corners, fine centering, virtually immaculate surfaces and a stellar verso complete this "best of the rest" gem that shares its supreme stature with a mere three other examples!